Open 9 -2 Saturday, Sept. 29, in Chanshtnu Muldoon Park, 1301 Muldoon Road (DeBarr). Last chance to fill up your freezer, fridge or canning jars with fresh fall produce from local farms and gardens at Muldoon Farmers Market this season! Locally cooked & baked foods, Alaska arts and crafts, live music. Kid friendly. Accessible playground. EVENT PARKING: Muldoon Mall lot, just north of the park. A short, paved walkway leads directly to the market. The market will close at 2 p.m. Sept. 29 and re-open in June 2019. Open 9 a.m.-2 p.m. Saturday in Chanshtnu Muldoon Park, 1301 Muldoon Road (at DeBarr). Fresh produce from local farms and gardens, locally cooked & baked foods, Alaska arts and crafts, live music. Family friendly. Accessible playground. EVENT PARKING: Muldoon Mall lot, just north of the park. A short, paved walkway leads directly to the market. 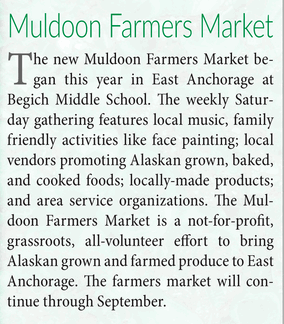 Muldoon Farmers Market will be open 9 a.m.-2 p.m. every Saturday through September 29.